Below is a list of demo surfboards we have at either our Seaside or Cannon Beach location. These are top of the line fiberglass and epoxy boards that are also available for sale. Click the links for more details on the boards. All demo surfboards and Kiteboards are $35 per day. Demo SUPS are $50 per day. All demo surfboards come with a board bag. If you demo a surfboard, SUP, or Kiteboard, you can apply the price of one day’s rental towards the purchase of a new board of your choice. 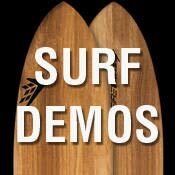 If you have any questions about demoing surfboards please don’t hesitate to call us at either our Seaside or Cannon Beach Location. Call us anytime to confirm the board you’re looking to demo is still available. This list was last updated on 5/26/2018.